Last month The Windsor Star reported that housing start were up 20 per cent in the greater Windsor area, which was an important bit of good economic news. But the figures could have been twice as good if not for a now chronic shortage of skilled workers. Builders are so desperately short of qualified staff they’re months behind on everything, from starting to finishing to closing sales agreements. How far behind are they? By hundreds of homes, according to some in the local industry. The shortage of skilled trades is partly due to the accidental circumstances of the local economy, partly due to some shockingly bad policy on the part of the Ontario government. This isn’t just an inconvenience, these chronic delays. It’s an economic tragedy in a region with high unemployment, low investment and low growth that’s starving local governments of much needed new tax assessment. We need those new homes built, pronto. Housing starts here hit a peak of about 1,600 new dwellings per year in 2003 and 2004. They’re on track to recover to about 777 this year, up 100 or so from last year, according to the Canada Mortgage and Housing Corporation. For Canada’s census metropolitan areas housing starts are the No. 1 barometer of good health for local economies: the higher they are, the better things are. Windsor’s CMA includes Amherstburg, LaSalle, Tecumseh and Lakeshore, a population of about 320,000 people. The starts number is crucial because it guides decisions on siting new restaurants and chain stores, among other things. Unfortunately for us, our CMA got hit by a metaphorical asteroid in 2009. That’s when the auto industry crashed, taking housing starts down to a 25-year low of 391 new homes. Starts recovered to only 680 units in 2013 and were expected to grow this year by another 14.6 per cent. Instead we’re up 20. But we could be up more, Klundert and others in the industry say. You can’t blame the trades workers, but most of them either retired or moved west to Alberta, B.C. and Saskatchewan when the work dried up. A few of those who relocated are now returning after hearing through the grapevine more work can be had here, Klundert said this week. “We’re starting to see some of them come back because of the cost of living out there,” he said of the booming West. But it’s just a trickle, so the wait between buying a new home and getting a move-in date keeps widening. “We’re pushing closing dates back out to February and March now,” Klundert says, when buyers would like to be in this fall. 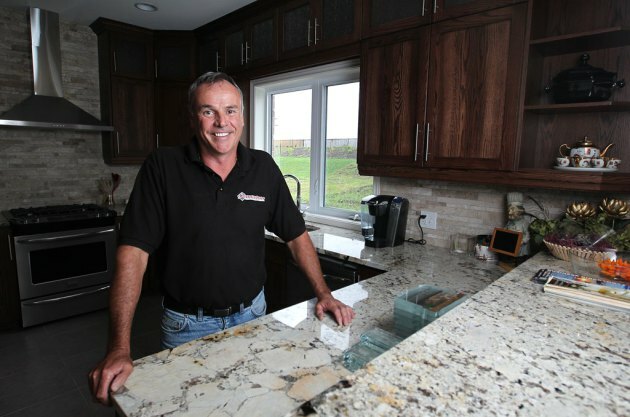 His company, BK Cornerstone Design Build, will construct 50 to 60 homes this year, down from about 75 in the good years. Klundert estimates the local industry is short by hundreds of skilled people, based on the calls he gets every day from fellow builders begging for leads on staff. Similar shortages are plaguing builders right across the province, sapping the Ontario economy of jobs and taxes it badly needs. Worst of all, the problem is in part a deliberate creation of the provincial government. The Liberals ran for re-election against a Tory promise to loosen up the ratio of apprentices to licensed trades people. The Liberals agreed to lower the ratios a tiny bit in Ontario Regulation 104-14, which came into force in April of this year. But they’re still far too complex and bureaucratic for builders to easily hire apprentices, says Stephen Hamilton, manager of government relations for the Ontario Home Builders’ Association. “It’s an artificial barrier to hiring, and it doesn’t benefit the public,” Hamilton told me Wednesday. But it won the Liberals the support of the unions. So there you have it: it is not just bad luck blocking local job creation, it’s bad politics, too. It’s also blocking spending and investment and the generation of new taxes. And people who don’t bother to vote say their vote wouldn’t change anything.